We are licensed to sell securities in CT, DC, FL, GA, MA, MD, MO, NC, NJ, NY, PA & VA. This website should not be considered a solicitation in any other state. Securities offered through J. W. Cole Financial, Inc. (JWC), Member FINRA/SIPC. Investment advisory services offered through J. W. Cole Advisors, Inc. (JWCA). Wall Street Alliance, Inc. and JWC and JWCA are not affiliated companies. Neither JWC nor JWCA nor their representatives provide legal, tax, nor accounting advice. If David Parsons provides such advice, he does so in a capacity other than as a Registered Representative or Investment Advisor. Wall Street Alliance is a boutique financial services firm specializing in individual and business planning with a focus on providing intelligent investment advice and disciplined asset administration. As the firm’s name implies, Wall Street Alliance hosts a network of professional alliances with nationally known firms on and off Wall Street, which expands the depth of experience and expertise available to better serve our clients in a constantly changing and challenging world economy. Wall Street Alliance strives to bring the knowledge and insight of Wall Street to Main Street as we provide our clients with financial and investment strategies that integrate their lifestyle and finances with their deepest felt values and goals. As CPA planners, we use an analytical approach to providing answers, while carefully incorporating our understanding of the markets and the economic factors that may impact the numbers and consequently, the results. Wall Street Alliance is dedicated to providing thorough and thoughtful processes to ensure that the strategies implemented are appropriate and are in the client’s best interest. For us, financial planning is not a one-time report, but an ongoing relationship with our clients. For that reason, our practice model is to become the center of our client’s financial life, not to be the biggest or most recognized firm. To that end, we are fiercely independent advisors, who are in no way obligated to any company or product. Wall Street Alliance believes that faithful stewardship is critical to financial success of the families and businesses we serve, regardless of our clients’ level of wealth. We believe that “well done is better than well said” and seek clients who share our values and appreciate the specialty services we provide. We invite you to stop by our office and discover for yourself the difference that a thoughtful conversation could mean to you and your future. At Wall Street Alliance, we recognize that you are continually required to make financial decisions, and while each decision may be made separately, the cumulative result of those decisions will determine your eventual financial success. We also recognize that an uncertain global economy, threatening inflation, increased government intervention, and higher taxation combine to create a complex financial environment in which to make sound long-term decisions. In today’s complicated world, we know it is important that the financial decisions made are compatible with the economic environment and realistic when considering your net worth and income. It is easy for those decisions to result in financial fragmentation and confusion. At Wall Street Alliance, we take the time to pull together the resources needed to consider the facts, potential results, and unintended consequences in our comprehensive approach to proactive planning for your personal wealth or the welfare of your business. At Wall Street Alliance, before considering any strategies, we must first understand you, as our client. The essence of our client relationship is to work within the intersection of your real life and your finances. Therefore, we strive to understand your values and perspectives, as well as your sincerest personal goals and financial objectives. Our recommendations have to incorporate all aspects of your life. To begin our relationship, we must identify and quantify your current financial circumstances. We review your assets and liabilities, cash flow and expense patterns, investment allocation and performance relative to expectations, income tax situation, and legacy planning provisions, including testamentary and trust documents. As we work with you, we tailor our services to meet your needs, desires, and preferences. We can provide any type of service from full Comprehensive Financial Planning to “Situation Reports” that address a very specific issue. These tools serve as a game plan for moving toward your financial goals. Implementation is followed with dynamic, proactive monitoring and updating. The impact of sound retirement planning has to last a lifetime, so we like to project your retirement to age 100 to help ensure you do not outlive your money. We are pleased to review your existing retirement strategy to analytically test its effectiveness. Where there are retirement plan options, the decisions made are critical and should not be left to intuitive thinking. We can provide Strategic Investment Planning or simply review your current holdings. With access to a myriad of financial instruments, investment programs, and professional asset managers, we are fully capable of properly executing your investment plan. We also recognize that in the “New Wall Street,” risk management is a critical element to the success of any investment strategy. We can provide estate planning tax reduction strategies for larger estates and also create Legacy Plans for those who want to have an impact on future generations. We can help the business owner with benefit plans for employees or just the owners, as well as assist in the capture of wealth from the business and optimizing the structure of any value-realizing event. At Wall Street Alliance, we recognize that there are major shifts occurring in the financial markets, especially as they apply to the individual’s personal financial planning. Over recent years, we have seen Exchange Traded Funds (ETFs) begin to capture funds that historically have been placed into mutual funds to gain both investment and tax efficiencies. With the increase in the estate tax threshold and the decline in portfolio values, we have seen a growing interest in Legacy Planning to assist future generations. Wall Street Alliance is a local business and is an integral part of the Tarpon Springs, Florida community. We are entrepreneurs, who are committed to serving in the community and in business for the long term. However, being a local, independent professional does not mean that Wall Street Alliance lacks global resources. Over the years, we have established alliance relationships with a myriad of financial, legal, educational, investment management, and back-office operations organizations. With alliances on Wall Street, we are able to provide investment insight and a unique knowledge of how the Street works. Our Wall Street alliances are integrated into the culture and are highly respected members of the Wall Street community. In today’s complex financial environment, Wall Street Alliance believes investment management is a full-time job, best performed by professional firms with dedicated staff who have the capacity and capability to closely monitor performance and measure risk on a daily basis. Wall Street Alliance maintains alliance relationships with respected money management firms on and off Wall Street that perform the rigorous due diligence that we expect in managing our client’s portfolio. Wall Street Alliance specializes in investment planning and asset administration. Any firm that handles investments must have access to a Broker Dealer and a Registered Investment Advisory firm to execute and process purchases and liquidations. We maintain an alliance with one of the leading Broker Dealers in America. They are also our Registered Investment Advisor and administer our fee-based advisory services. Wall Street Alliance is experienced with businesses that may want to implement Executive Rewards programs. We have alliances with recognized legal authorities on executive benefits and business retirement plans. We offer turn-key service from plan design to administration, including document drafting. We also have alliances with 401(k) providers that provide open architecture platforms for flexibility and fee management. When families are seeking estate and legacy planning, Wall Street Alliance has alliances with local law firms, which can prepare needed testamentary and trust documents. But document drafting is only part of the solution. We provide the design based on the desires of the client for creating their own personal legacy. We also like to maintain relationships with our clients’ tax preparers to ensure consistency of advice and coordination of financial and investment strategies. David W. Parsons is the founder of Wall Street Alliance. The creation of this firm is the culmination of his life’s work in the financial services industry. David has brought the best of what he has learned and experienced on and off Wall Street to the vision and mission of Wall Street Alliance. There are few advisors with such a broad multi-disciplined approach to working with clients. His experience and knowledge come from his years in the public accounting profession, the investments industry, the insurance industry, the financial planning profession, and from every aspect of working with clients and families at all levels. He is dedicated to helping people and considers the services he provides to clients as a labor of love. He has a passion for helping others. 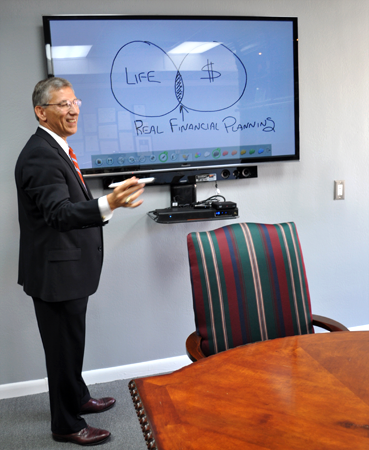 As a CPA financial planner, David was the first National Director of Personal Financial Planning for the Wall Street CPA firm of Oppenheim, Appel & Dixon, where he performed the personal planning for partners of some of Wall Street’s most prestigious firms. He later moved to Price Waterhouse, where he initiated, developed and managed the International Executive Financial Services Group, the CPA profession's first practice to provide financial planning and investment services to globalists and expatriates in Europe and the Pacific Rim. As a result of his international planning expertise, he was recruited by Chase Manhattan Private Bank in New York City to be the Vice President of the Financial and Estate Planning Department, where he served some of New York’s wealthiest residents. He left New York to join an Executive Benefits consulting firm to design and market non-qualified executive benefits, where he designed and marketed his patented global retirement plan program to multi-national Fortune 500 companies. To complete his corporate career, David devoted ten years to Transamerica Financial Advisors (TFA) in St. Petersburg, where he was the leader of a national financial services business with 90 offices in 26 states. In this role, he helped independent financial advisors across the country better serve their clients, while he continued to serve his personal clients. One of David’s significant accomplishments is being the Co-Founder of The Wall Street Academy. The Academy is a comprehensive, professional training program conducted in the NewYork Stock Exchange (NYSE) for select independent financial advisors from across the United States. The experiential training includes classroom instruction and time on the floor of the NYSE. David is a graduate of the United States Naval Academy, where he played varsity football and lacrosse. His accounting education was at North Carolina State University. David has authored several articles on financial topics and has been quoted in such publications as The Wall Street Journal, USA Today, and others. A retired Navy Captain (helicopter pilot), as well as a Rotary Paul Harris Fellow, David lives in Tarpon Springs, Florida with his “bride,” Donna. Together they have five children. If he is not at the office, he is probably on the water or playing the trumpet in his church. Please call our office at 727.940.5284 or send us a message by completing the contact form below. © 2016 Wall Street Alliance. All rights reserved. Securities offered through J. W. Cole Financial, Inc. (JWC), Member FINRA/SIPC. Investment advisory services offered through J. W. Cole Advisors, Inc. (JWCA). Wall Street Alliance, Inc. and JWC and JWCA are not affiliated companies.